This groundbreaking book is the first to provide state-of-the-art information on the current changes and developments in European food and agricultural marketing. Food and Agribusiness Marketing in Europe contains broad and up-to-date coverage of agricultural and food marketing by experts in a variety of European countries including Germany, Greece, Italy, the United Kingdom, France, Ireland, Belgium, the Netherlands, Spain, and Hungary. 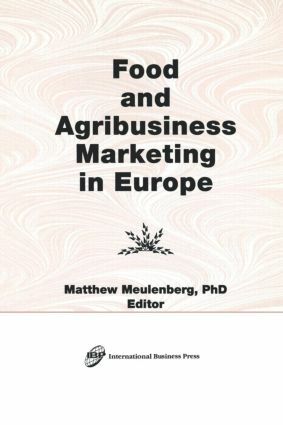 With chapters selected by the famous marketing specialist Matthew Meulenberg of The Netherlands, this enlightening book allows food and marketing professionals to gain new perspectives on the changing roles of food retailing and food industry in agricultural marketing and the structure of agriculture and food markets. Food and Agribusiness Marketing in Europe is the first resource available that provides essential information on the tremendous changes in food and agricultural marketing in Europe. It is an invaluable reference on European marketing for students and teachers of agricultural marketing, European-oriented agribusiness managers, and internationally oriented agriculture policymakers who need to develop an understanding of food marketing developments in this area of the world.